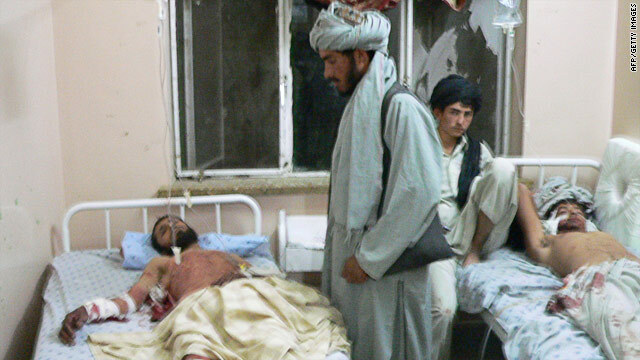 Victims of an attack on a wedding ceremony in Afghanistan's Kandahar province receive hospital treatment, June 10, 2010. Explosion came during dinner, between 9:30 and 10 p.m.
(CNN) -- A bombing at a wedding ceremony Wednesday in Afghanistan's Kandahar province killed 40 people and wounded 74 others, officials in the village of Nagaan said. The International Security Assistance Force confirmed the bombing but had no information on casualties. They and Afghan forces have secured the area, they said. The explosion came during the wedding dinner, between 9:30 and 10 p.m., striking the area where the men and boys were dining separately from the women. All the casualties were men or boys, village officials said. The incident took place in the Arghanab district, about 30 kilometers (19 miles) from the city of Kandahar.